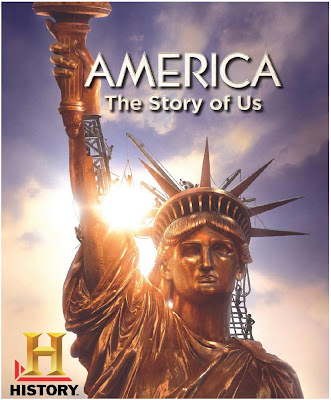 Last night I started watching a very well produced series on History Channel, America, The Story of Us! I was disappointed that there was no mention of beer in the the first 150 years. Tobacco, yes. Beer, NO! Virginia colonists brew ale using corn. First shipment of beer arrives in the Virginia colony from England. American "Help Wanted" advertisements appear in London seeking brewers for the Virginia Colony. Adrian Block & Hans Christiansen establish the first known brewery in the New World on the southern tip of New Amsterdam (Manhattan). The first non-native American is born in New Amsterdam, (perhaps the first non-native American male born in the New World) in Block & Christiansen's brewhouse. Jean Vigne grows up to become the first brewer born in the New World. Pilgrims arrive in Plymouth in the Colony of Massachusetts aboard the Mayflower. Beer is extremely short on board ship and the seamen force the passengers ashore to ensure that they will have sufficient beer for their return trip to England. I know that some of my long lost Kuhn relatives were vintners; It's more than possible that a few were brewers. 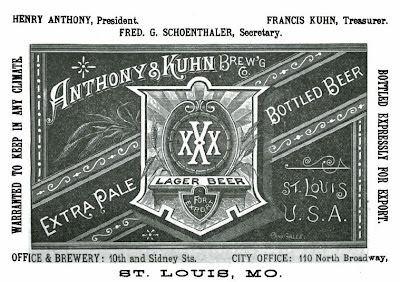 FAILURES IN BUSINESS; A ST. LOUIS BREWERY FIRM'S DIFFICULTIES.CALL FOR A MEETING OF THE CREDITORS OF THE ANTHONY & KUHN COMPANY--FAILURES ELSEWHERE. ST. LOUIS, Sept. 19.--A rumor, which was soon substantiated, gained ground on 'Change this morning that the Anthony Kuhn Brewery Company, a concern recently incorporated by Henry Anthony and Francis Kuhn, of the firm of Anthony Kuhn, and Austin Voght, had succumbed to financial embarrassment. I guess it survived that battle, but I've read that in 1922 Anthony & Kuhn Brewery of St. Louis was sold to a laundry (clothes washed in beer?). Just some odd ramblings for today. Love the new series. I've been DVRing it for viewing when I get a chance. As you said, very well produced. I did see the tobacco episode. I'll have to check out the link later this evening. Love the Kuhn Brewery story. "financial embarrassment"...at least they called a Spade a Spade back then. Now, it's called reorganization through bankruptcy...or if you're Donald Trump...a new business venture! I think I look more like the Heinzelmännchen (gnome-like creature). I'll email and see if I can get a "family" discount. Bein a gnome is not that bad! You could apply to replace the wooden gnome on Travelocity...then get free travel to drink beer all over the world!